Considering its proximity to Kathmandu, stark Himalayan views, densely wooded areas harboring a wealth of flora and fauna and connection by road – no need to rely on small Short Take Off and Landing aircraft that fly to postage stamp size airfields in the far flung remote area of Nepal, it is a surprisingly little traveled area and offers great mountain scenery and cultural exposure. The Langtang National Park is situated due north northwest of Kathmandu and is the home to about 4500 people, a majority of whom are Tamangs. (Tamag is Tibetan for Horse Warrior). Tamangs are thought to have descended from the border police sent by the Tibetan king Trisog to patrol his southern borders with Nepal around 755 CE. At the head of the Langtang valley is Langtang Lirung 7246 m. About 25% of the The Langtang National Park is forested with Oak, Maple, Pine and Rhododendron and is home to the Himalayan Black Bear, the Rhesus Monkey, the Himalaya Thar (a sheep -like animal), the Snow Leopard, the Himalayan Wolf and the Red Panda among others. There are also many varieties of orchids and the park harbors and amazing array of bird life. This is also a great place to observe wild flowers which bloom during the monsoon. A long but, scenic drive from Kathmandu ends some eight hours later at Syabrubesi where your camp for the first night will be set up some distance from the village. 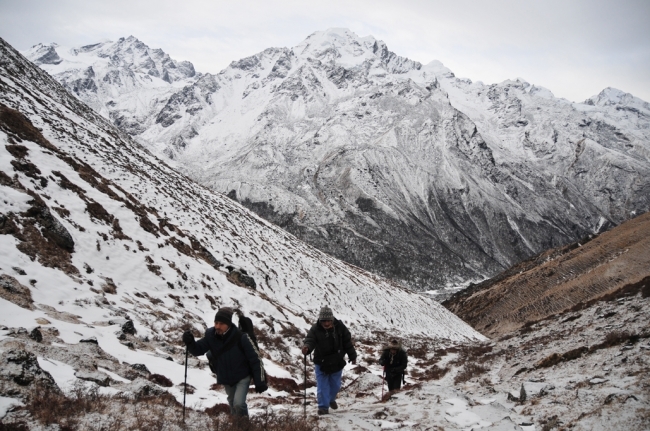 Gaining elevation steadily you will arrive at the village of Kyanjin Gompa and explore the Langshisha Glacier. Return to Syabru, the diversion to Kyanjin Gompa and subsequent high altitude trek having served to acclimatize your body you will be in a better position to make the steep trek up to Gosainkunda Lake at 4380 m. via Sing Gompa at 3250 m. The Gosaikunda and its surrounding Lakes are of immense importance to the Hindus and the site of a major religious festival in August each year. The Hindu God Shiva is said to have created this lake to quench his thirst after consuming poison! From Gosaikunda Lake you will climb further to the Laurebina Pass at 4610 m. and then heading in a general south easterly direction through the villages of Ghopte, Tharepati, Melamchi Gaon, Tarke Ghyang and Mahankal to Sundarijal from where you will drive back to Kathmandu. Day 12 Explore around the lake.